The journal of the Association of Schools and Colleges of Optometry. All rights reserved. 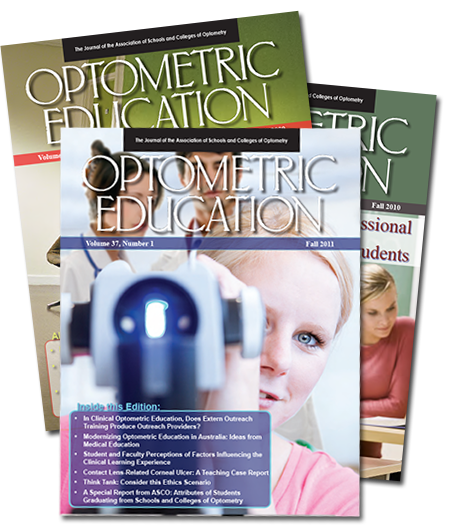 Optometric Education is published three times per year. To access Optometric Education online, please go to www.opted.org. A limited license to use Optometric Education for your personal, educational or other noncommercial use is provided to ASCO members and the general public. No part of this journal may be reproduced or transmitted in any form or by any means for any commercial purpose without permission in writing from ASCO. Use of information in this journal is voluntary. The opinions and information included in the journal are provided by the authors. Because ASCO does not endorse or warrant the information in this journal, you are advised to use the information after your own review of it and the information’s reliability for your purposes. You understand and agree that ASCO is not responsible or liable to any party for any direct, indirect, special or other damages for use of the information contained in this journal or websites linked from this journal. Advertising rates are available upon request. OPTOMETRIC EDUCATION disclaims responsibility for opinions expressed by the authors. Indexed in Visionet, Vision Cite, Educational Resources Information Center (ERIC) 1979-2003, and Directory of Open Access Journals (DOAJ).